If you are one of the many who mistakenly believe that buckwheat is a member of the wheat family, you are not alone. The name can be quite deceiving, because this mighty food is not related to the grass family at all. Buckwheat is actually classified as a member of the pseudo-grain or cereal family. Rather, it is a flowering fruit seed of an herb related to the rhubarb plant. Along with amaranth, teff, wild rice and quinoa, these super seeds have many of the same properties as a grain. They do not contain gluten and yet are high in protein, easier to digest, and rich sources of complex carbohydrates. Over the past few years, buckwheat has gained huge popularity in the health-conscious community as it provides large quantities of nutrients. In particular, it contains the eight essential amino acids that are crucial to maintain a healthy vegetarian diet. Buckwheat is an especially rich source of tryptophan, which can be hard to obtain from many foods. This amino acid is a neurotransmitter and precursor to serotonin that is recognized for its ability to help balance the mood and provide mental clarity. This pseudo-grain is also rich in many minerals including impressive quantities of manganese, magnesium and calcium, as well as fibre and various B vitamins. Available at most health food stores and bulk sections, buckwheat can be purchased in three forms: raw, roasted or flour. The raw hulled form of buckwheat is called groats. Uniquely triangle-shaped, the kernels can be beige or light green in colour and have a pleasant, mild nutty flavour, making them an easy addition to many dishes. 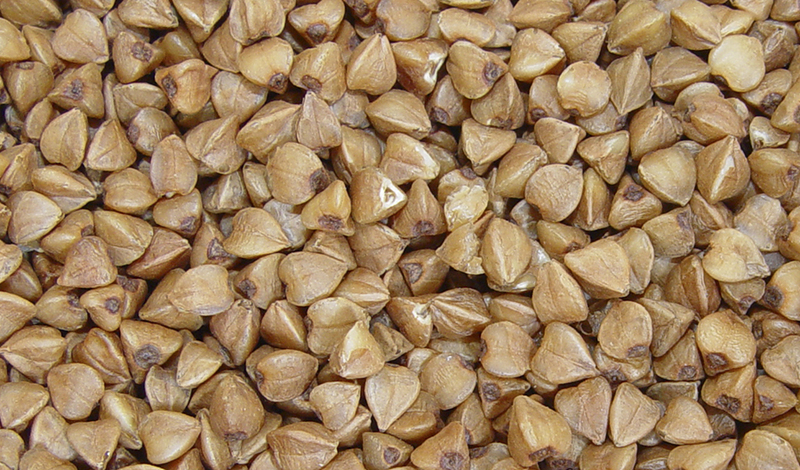 Buckwheat can be purchased in a toasted variety called kasha, which has a much more intense and pronounced flavour that can be described as earthy. Raw groats can be stored in an airtight container in a cool, dry place for about 6 months, but buckwheat flour should always be kept in the refrigerator to maintain freshness. It will keep for three to four months in a well-sealed container. Buckwheat is an extremely versatile seed and makes a great alternative to plain rice. It can be cooked with a ratio of one cup of buckwheat or kasha to two cups of water. Once rinsed, simply add to boiling water, cover and reduce to a simmer for 20 to 30 minutes. It can also be added into a granola recipe or sprinkled on top of plain yogurt. And simply grinding the buckwheat groats produces a nutritious and gluten-free flour that can be added into recipes for muffins, cookies, cakes or the best yet … pancakes! In a medium bowl, mix together buckwheat flour, flaxseed, rice flour, oat bran, coconut sugar, baking powder, salt, cinnamon and nutmeg. Set aside. In a large bowl, blend the banana, egg and milk until smooth. Add in the dry ingredients and mix well. Heat a pan or grill to medium and lightly grease with coconut oil. Pour the pancake batter onto the pan to the desired size and top with blueberries. Cook until bubbles appear and then flip to the other side for another five minutes, or until done. Enjoy with pure maple syrup or chia berry jam.